This 30-acre landscaped park has an ornamental lake, a rose-garden and many old and unusual trees, including a several hundred year-old Cedar from Lebanon. 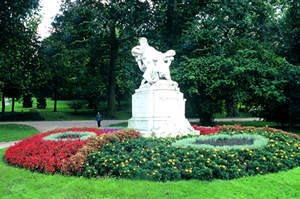 The park is named after Ernest Meissonier, a painter who lived in Poissy in the Enclos de l'Abbaye between 1846 and 1891. Every days, from 7 a.m. to 10 p.m.
Public lavatory, Drinking water fountain, Marriage photos, Children's playground, Dog admitted if kept on a lead, Carpark arranged. R.N. 13 or A 13 Rouen Direction - Exit n° 7 Poissy. A 14 Defense - Poissy - Orgeval. Station of Paris Saint Lazare until Poissy. R.E.R. Line A5, Direction Poissy.